Amazing connections can be made, and powerful ideas can blossom when organizations come together to work collaboratively on a project. 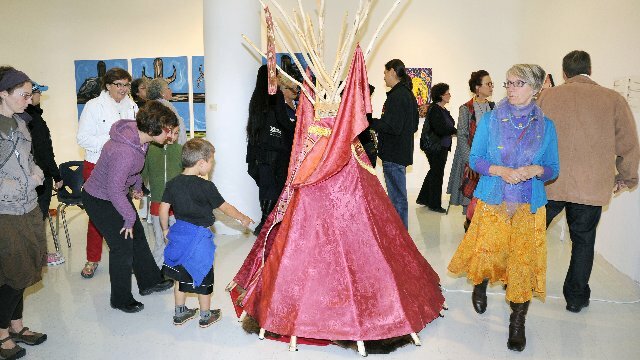 Such is the case for Métissage, a multi-venue art exhibition and panel talk exploring the connections between Fransaskois, Métis and First Nations cultures in Saskatchewan. "It's a medium that we had never worked with before to create a dialogue between the communities,” says Frédéric Dupré, director of community engagement at the Institut français. “It was also a terrific opportunity to celebrate 2012 as the year of the Fransaskois." According to Dupré the exhibition and subsequent panel talk were successful for a couple reasons. "Firstly, the quality of the art exhibited was amazing and it really made an impression on the public,” he says. “Secondly, we were able to reach a lot more people with our collaborative community engagement efforts than when we’ve done it alone in the past." For the Institut français, this exhibition is only part of an ongoing initiative to bridge the Fransaskois and Métis communities. For the past five years, the Institut français has been coordinating efforts to connect communities, such as round table discussions, travelling theatre productions and now, this year, a visual art exhibition. The exhibition, curated by Katherine Boyer, gallery and collection manager at the First Nations University of Canada, was compelling with many narratives and diverse perspectives intersecting. "The project started out on a much smaller scale and continued to expand over time," she says. The process for curating the show began with a call for submissions over summer of 2011. As a curator, Boyer began to see themes emerge, such as community, land, people and spirituality. She used those themes to divide the work into groups that would be exhibited together in the four different locations (The Fifth Parallel Gallery, First Nations University of Canada Gallery, The University Club and the Institut français). The opening reception for the exhibit was unique and included a guided walking tour between the exhibition spaces led by a Métis fiddler, Nathaniel Baker. At the last stop, visitors enjoyed a performance by the Wambidi dancers – a contemporary First Nations dance group. "It was important to include the Wambidi dancers in this event, as they embody both traditional and modern aspects of First Nations culture,” Boyer points out. “A live performance brought an entertaining twist to an exhibition opening." The Métissage exhibition and panel talk were supported by SaskCulture's Métis Cultural Development Fund, The Saskatchewan Arts Board, the Institut français, the University of Regina and the First Nations University of Canada.